As a new mother, your first priority is your baby. However, you can’t forget to also take good care of yourself. Here are eight tips to help you become a fitter, healthier mommy. If you want to be healthier and fitter in your mind and body, you can! Your post-natal transformation may not be easy, but with the right information and the proper protocol, you'll make more headway than you ever thought possible. Believe us! We know how it feels to be busy, exhausted, and mentally drained. Those feelings are just par for the course for a new mother. To make the changes you want to see, you have to learn how to become mentally tough. Remember, you're not alone in your desire to change. The Fit Mommy Manual is here to help! Here are eight tips to get you started. Although it's not a word usually associated with the arrival of a new baby, organization is definitely an important part of a new mother's life. We start to plan our baby's sleep times, feeds, bath and play times, and just like our baby, it is important that we establish some routine in order to look after ourselves. You don't have to plan your days with military precision or live your life by the hands of a clock. Instead, use a short checklist of tasks to complete each day. It will help you feel good and provide the never-ending energy you need to look after your baby. "Positive self talk" is a technique used widely in the sporting arenas to help keep athletes focused and in their optimal state of mind. It is an internal conversation to create motivation, specific positive emotions, and belief. You don't have to be an elite athlete to use it! For example, while working out, don't listen to that internal voice that says, "This is too hard, I can't do it anymore." When we hear these words, they become our belief. In order to create a positive belief and therefore outcome, we must use positive self talk. If you tell yourself you can do one more repetition or walk one more mile, you will. Going it alone can be tough. If you don't share your goals or promises, it's much easier to convince yourself that they don't matter and that you didn't really want them in the first place. For example, if you haven't told your partner about your goal to get back to your pre-baby body, his Saturday-night plate of nachos may be too tempting to resist. It's just too easy to tell yourself "No one will know if I cheat." Before you know it, you convince yourself that it's OK.
Had you shared the goal with your partner, he could have been more supportive. Maybe he would help you make something healthier, or wouldn't eat nachos in front of you. Whatever the case, you'd be better focused if someone could help keep you accountable. The more people can support you, the more aid you'll have in your goal-orientated decisions. Sharing your goals with others can be motivating, too. You'll have something to prove! Fit Mommy Manual Top Tip: Share your goal on social media! Seek out role models. Find someone who has achieved the success you aspire to. As a new mom, look for someone who dealt with child care, lack of time, and full-time work. Find someone who has been successful and appears relentless in her pursuit of achieving goals. Observe your role model's lifestyle, regimens, and ethos. Use their success as a road map for our own. Ask The Question: "What would my role model do?" This will help you stay on track. 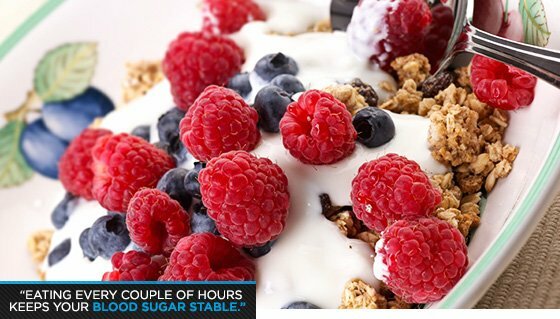 Eating every couple of hours will keep your blood sugar stable. If you start off the day with a healthy breakfast, it's easier to follow through for the rest of the day. A goal is essential in any journey. It gives focus, clarity and a reason to take certain actions. Without a clear picture in your mind and a definitive plan of how to get there, you'll be less likely to make permanent life changes. When setting your goal, the desired outcome must be something you are passionate about. When you think about it, you should feel a shift in emotion and a burning desire to achieve. Your goal should not be something your friend wants, a family member seeks, or even something you think you should want to achieve; it should be individual to you, no exception. If your passion is intertwined with your fitness, your hard work will be much more rewarding. Women often make the mistake of setting goals that are too fluffy: "I want to lose weight," or, "I want to tone up." These are not good goals. You need to be specific and attach some form of measurement to the statement. You also need to establish a timeline. A more thoughtful goal sounds something like this: "By March 29, I will lose three inches from my waist."